I’m always checking around for/out new pieces of gear and sound options. Sometimes I will experiment with various little creations of my own and other times I will see something someone else created that just seems like a really cool bit to add to the drum set. In the latter category can be added a couple of pieces of kit I’ve been using lately that I’ve truly fallen in love with. They are well thought out and designed, well made, and easy to use. 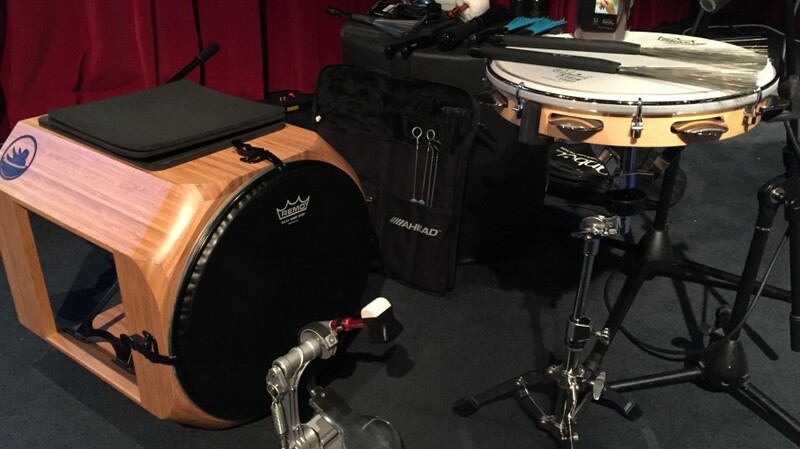 The result is a wonderful extension to the sounds I’m able to create on my drum kit.The products in question are the Big Fat Snare Drum muffling rings and the Switch Kick interchangeable beater. I’m going to introduce you to each one. We have all done it. Cut up old drum heads and laid the mylar circle on our snare drum or tom head. Or, just placed tea towels or a handkerchief on a drum to give it some more body and wallop. These are all fine and they work great. I use them all the time. What the good folks at BFSD have done is create a much better mouse trap. BFSD couldn’t be easier to use. You place one on top of your existing snare head and it lowers the pitch of your drum quickly and easily. “Yeah, but I can already do that!” you say. Fair enough. What makes BFSD a better mouse trap are a couple of things: there is a thin rubberized gasket that goes around the outside perimeter of the ring for weight, balance and stability. There is also a thumb cut out for quick removal. This is where BFSD comes into its own. It’s easy to use and effective. 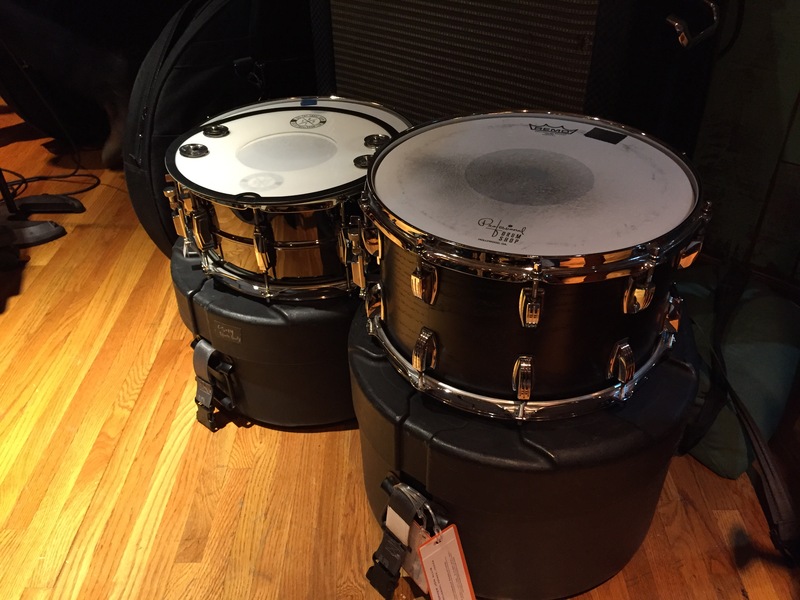 The combination of mylar and rubber ring gives your snare drum that deep & warm tone. There are several different varieties of the BFSD ring (available in 13″and 14″ sizes). I’m going to highlight a few of them here. This is a full head with the rubberized gasket and thumb cut. This gives you that fat, gushy, ‘birthday cake with a baseball bat’ kind of sound. Try adjusting your snare tension once you put this on and you can get some really fantastic results. The ‘original’ muffles things enough where you really hear the rattle of the snares underneath a very pleasing ‘thud’ from the head. Designed by Steve Goold, this option has about a 4″ hole in the center (hence, donut) and it gives you a more medium muffling choice on the drum. Not quite as gushy as the ‘original’ but wonderful for that fat 70’s drum sound. Think “Take the Money and Run” from Steve Miller and you get the idea. I’m really happy to see my friend, Josh Day, get a nod with this item. Take the “Steve’s Donut” and put 4 sets of tambourine jingles on it. That is the essence of “Josh’s Snare-Bourine”. This is great with a mallet and the snares off. With the snares on and a stick in your hand it has a great snap to it. Playing nearer to the jingles (obviously) make them more pronounced and everything stays in place because of the rubber ring around the perimeter; so you can really have at it. This is a full BFSD head with 4 sets of tambourine jingles attached. You get a bit more thud in your sound because of the full head and I find that the jingles are a little more pronounced because you’re taking a little more frequency out of the drum. It is also really wonderful on 16″ and 18″ floor toms. I use these a lot either on their own, or in combination (typically “Steve’s Donut” on top of “The Original”, or “Josh’s Snare-bourine” on top of either “Steve’s Donut” or “The Original”). I also, on occasion use “Steve’s Donut” and “Josh’s Snare-bourine” on cymbals. I like what they do to the decay. Here’s a picture of a stack of BFSD goodness at a recent session with “Josh’s Snare-Bourine” on top. I was in the studio with Deana Carter not too long ago working on her new album and I used the BFSD stuff A LOT! Deana and the engineer (Paul Horabin from Ready Mix Recording) really loved the variety of sounds I was getting. It was easy to change. Stayed in place. And, it sounded great. In fact, Paul was so knocked out by them that I wound up giving him mine to keep at the studio and ordering another set for myself! That’s how much I love this product. I bought it twice! On purpose! All of the BFSD products range in price from $21 to about $32 depending on the model. They also have combo packs that you can purchase from the website (click here to go to the shop page). I really love this product and look forward to seeing what they come up with in the future. I was at the Hollywood Vintage Drum Show in early October and came across this most interesting item. I talked at length with creator, Kevin Smith and as we talked I realized that this device would be of potential use in a few different playing contexts I’m in. So, I bought it. It is, the Switch Kick. This is an interchangeable bass drum beater. 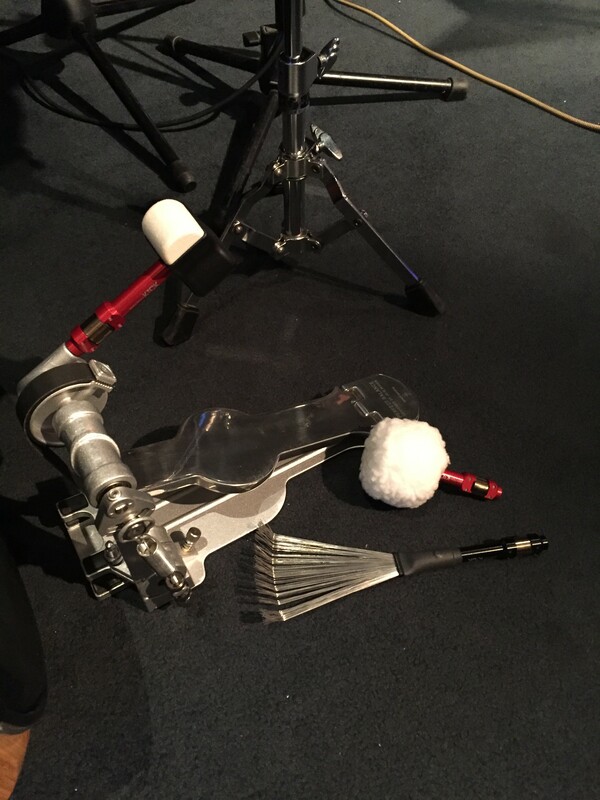 Meaning, you have a central shaft that you attach to the bass drum pedal, and then you can change out from a variety of different beater options. The beaters are machined from lightweight aluminum and finished in red, black, or a natural finish. To start you buy the shaft and a standard double sided felt/plastic beater – like a DW. You then can purchase additional beater options including: Big Felt Beater, Brush Beater, Leather Conga ‘Slap stick’ Beater, Bundled Dowel Beater, and a small and large variation of what they call the ‘Sonic Beater’ (where the beater area is a hard ring – the rest of the area is hollow – and air is allowed to escape from the beater once the drum has been hit). The latter two options also are self aligning. A handy feature. Changing a beater head is pretty easy. Twist the beater 45 degrees and pull it off. Take the new beater you want to use and line it up on the shaft. Push the beater down to the desired length and then twist it back into place. Play. I’m looking forward to checking out the different beaters that are offered. Particularly with the Sonic Beaters. It will be interesting to see what they sound like twisted to their sides so you hit the bass drum with a small oval bit of solid rubber/plastic instead of the larger hollow circle of rubber. That reduced surface area should yield some interesting sounds. Like the BFSD, the Switch Kick is a easy way to alter your tone live or in the studio without having to swap out bass drums or bass drum heads. I can see a world of opportunities where this would be very useful. Another note about these beaters. Because of their design they don’t rattle or make noise once you put them on. They stay locked in place and they are quiet. They are also light enough where you don’t feel like as if you have to change your technique. With the ability to adjust the height of the beater itself (independent of the shaft), whether you play an 18″ or a 26″… you’re going to be able to get the beater head right where you need. 1) The Brush Beater is a little tall for things like 16″ and 18″ bass drums. I would love to see a variation of the brush that perhaps was a little shorter and a little fuller that would allow for the same ability to use on a smaller diameter bass drum. 2) You need to be aware when you put a new beater on. Because you have points of contact where you could pinch skin on your hand when you’re changing a beater, a little mindfulness is required to not ding your hands up. I would like to point out that I didn’t do this, but Kevin did mention it to me when I bought the product at the drum show. Other than these things, this is a really unique concept and it really works. The BFSD rings and the Switch Kick actually helped to get me out of my sonic rut I was in. How? Simple! When things sound different, you play different and that was certainly the case with both of these products. You don’t fall back on the same grooves and riffs you might normally play. You get to hear things with slightly different ears. That’s what I got from these two products. I was able to make music with them and adjust my own head/ear space positively. Now that I have been using both of them for a while, I’m very pleased with the results I’m hearing and think they were a worthwhile investment. Check them out if you get the chance.